I don’t really know Frank Beamer well. I was around him a handful of times a year for a decade or more as a sports columnist. I didn’t sense a lot of spin in the guy. I thought he pretty much told it like it was, except for some schedule-padding and news-manipulating stuff back in the day when he was trying to make Virginia Tech matter. Which he did. I sat next to him once at a banquet. We chatted and laughed a bit. He is a good fella. The career eulogies bursting forth upon the recent announcement of his retirement as Virginia Tech’s football coach are earnest and true. Beamer was hardly glib. He was hard-boiled Fancy Gap. But he got it. He has class. Self-control. He was as professional as they come in college football in representing his school and his team on the field and in the media room. A gentleman. Yep, he is a gentleman. Of course it won’t be the same to see a Virginia Tech football game without Beamer on the sideline. We’ll get used to it. So will he. Sooner than he suspects, he might even enjoy being out of the snake-pit cauldron of constant recruiting, social media, message boards and instant judgments. I hope it happens that way for him. He deserves it. He made Virginia Tech football into a thing of consistency, respect and resiliency, even if that national championship the Hokies hungered for proved too large a dream. Tech’s stadium, and the field inside it, are already named in honor of others. But Beamer-Lane Stadium isn’t too awkward, is it? In the big picture, it doesn’t really matter. Virginia Tech knows the impact Beamer had on its national profile, its enrollment, its fund-raising, and Beamer knows, too, what he meant to his alma mater. For both, that is a monument in itself. 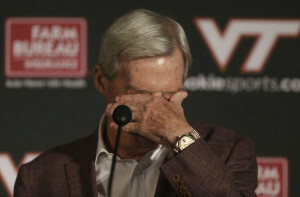 Happy trails to Frank Beamer.